Along with exciting, up to the minute designs for crochet shrugs, boleros, ponchos, bags and other fashion accessories, there's now a whole range of gorgeous, and affordable, Tess Dawson luxury yarns. Although the yarns are made from some of the finest yarn available, we have made sure that they are still truly affordable. 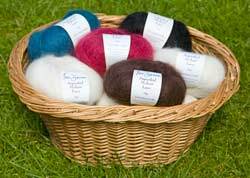 All of the yarns are now available in bags of 10 and we are sure that once you have knitted with your first order you'll be back for more. Tess Dawson's Knitting and Crochet patterns are also available to buy here.